A serious new vulnerability notice about Java exploits has been issued by the Department of Homeland Security’s Cybersecurity Division. Java 7 Update 10 and earlier contain a vulnerability that can allow a remote attacker to execute malware on vulnerable systems. Some webpages may include content or apps that use the Java plug-in. There is no fix for this yet, so it is recommended that you protect yourself by disabling Java in your particular browser. Please see our previous blog How do I disable Java in my browser for instructions. 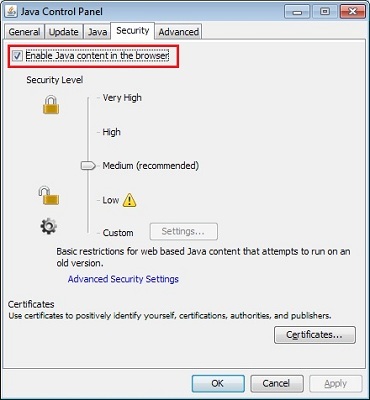 For a higher level of security, it is possible to entirely prevent any Java apps from running in a browser by de-selecting Enable Java content in the browser in the Java Control Panel under the Security tab. Disabling Java through the Java Control Panel will disable Java in all browsers.